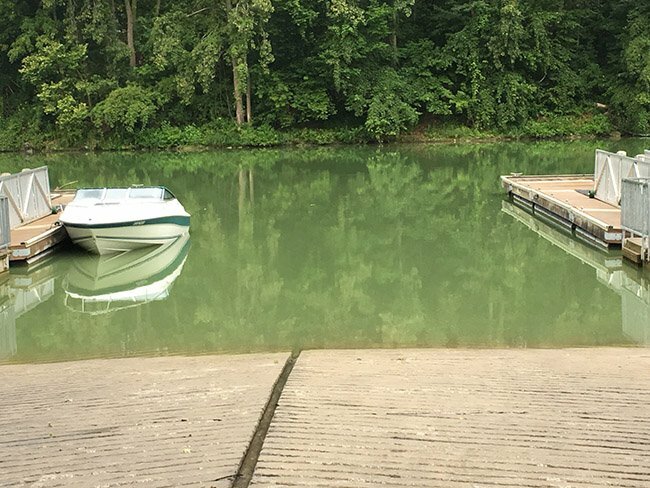 Chatham – LTVCA staff noted a discolouration in the Thames River on Monday August 28 and contacted the Ministry of the Environment and Climate Change (MOECC) in London. MOECC staff undertook sampling at several locations and advised on Tuesday that it was a cyanobacteria bloom (blue-green algae) in the Thames River. They confirmed that the samples taken contained the species responsible for shutting down drinking water intakes on Lake Erie. MOECC identified a small population in McGregor Creek, which did not appear to be the seed population for the Thames. They sampled as far up as Kent Bridge Road but the river did not appear to be affected. MOECC determined that the cyanobacteria bloom seemed to be focused around central Chatham, which was confirmed by LTVCA staff when driving the river from Kent Bridge down stream to Prairie Siding yesterday afternoon. The bacteria does not always produce the toxins associated with fish kills and other threats to animal and human health. LTVCA staff did not witness any fish die-offs when reviewing the river yesterday. However, people should take extra caution and avoid the river, especially children, pets and livestock. Animals should be kept away from the water and not allowed to drink from the river. Officials from the MOECC, Health Unit and LTVCA will continue to monitor the situation and provide updates when available.